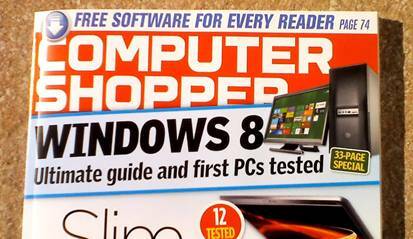 Comment Out and about shopping yesterday, I spotted a PC magazine in the newsagent advertising the ‘ultimate guide’ to Windows 8 in the form of a ’33 page special’. As well as reminding me of reports that Microsoft is planning to spend over $1.5bn on Windows 8 marketing, it made me think of those horribly contrived YouTube videos in which some smart arse presents his Dad with a Windows 8 installation, offers no coaching or explanation, then records him struggling (examples here and here). The purpose of such videos is to illustrate the unintuitive nature the Windows 8 user interface, making the point, either directly or indirectly, that Microsoft has got it totally wrong. When I first saw this stuff emerging, I remember saying to a few a people how these were pure attention grabbing stunts that bore no relation to how things would pan out in the real world. The truth is that users generally aren’t sat down in front a new installation of a new operating that someone has set up for them and just told to get on with it – that almost never happens in either a domestic or a business context. And even if users find themselves rocking up to an unfamiliar environment cold and asking someone for help, they are not just going to be told “You’re on your own; you work it out”. Apart from the obvious clues on new features and navigation presented during the initial setup, Microsoft and OEMs invariably provide some basic documentation in the box to get users going with each new release of Windows (e.g. ‘quick start’ guides). Beyond this bundled help, it was then pretty certain that for a few months leading up to and following the Windows 8 launch, we would see every self-respecting PC magazine publish extensive reviews and guides of their own, covering basic education along with tips and tricks to get the most from your new system. The one I referred to above is the first I have seen on the shelves, but you aren’t going to be able move for this Windows 8 awareness and educational stuff pretty soon. As I have already reported, my own experience of Windows 8 is very positive on desktop configurations driven by a mouse and a keyboard, and my teenage daughter has had a good experience of a dockable slate running the new OS. So is it perfect? No. Is there room for improvement on the initial release? Definitely. Dale Vile is the managing director of Freeform Dynamics, an IT analyst firm.